Hey guys, Ryan here. It’s been a while since I did a ‘thoughts’ article. While BRM mostly covers indie content, the real philosophy of the site is to expose people to new things, and that includes thoughts. Though sometimes thoughts are about politics, this isn’t a political column. It’s not Huffpo, or The Daily Wire, we’re not trying to reinforce your pre-existing viewpoints or have a consistent narrative. We’re trying to bring up subjects that may not necessarily have any press or public attention, or take a different angle on popular subjects apart from the rigid duopoly of opinions that scream at you on the internet. Today I want to talk about something close to my heart: dogs. Everyone loves dogs. Online videos of dogs doing cute things is one of the most popular things on the internet, and definitely one of the most wholesome. A pleasing respite from unending internet drama. But, beloved as dogs are, there’s a lot going on behind the curtain that concerns me. Roughly 50% of all dogs that are processed by animal shelters are euthanized. Approximately 3.2 million dogs are processed each year, and only 1.6 million are claimed. The rest are eventually euthanized at the shockingly high rate of 93%. 5,500 dogs are euthanized in the United States every day. The costs of running animal shelters and euthanasia facilities costs American taxpayers ~$1B per year. There are 70 million stray dogs in the states, though estimates are hard to confirm. Loose estimations point out that only roughly 10% of dogs born in the United States ever find a permanent home. I’ve seen varying versions of these numbers, but they all point in the same direction: K-9 homelessness is a significant issue, euthanasia is commonplace, and dogkind, our species’ best friend, goes through a lot of unseen suffering. The whole process we have to deal with the issue is expensive, inefficient, and has the undesirable byproduct of mass dog-murder. A lot of the solutions you see proposed online are about increasing neutering rates, PR campaigns to get people to go for shelter animals instead of purebred pups, and increasing animal shelter spending so more no-kill shelters can be funded. The problem I see with each of those solutions is that they all attack one or two of the three key problems while worsening the others. Changing the type of dogs people get doesn’t increase the overall amount of dog placement — it just shifts the issue around; neutering pets is in the same vein as euthanizing them, it’s a eugenics program; and no-kill shelters, while great, and something I support, increase the already sizable cost to taxpayers and charity organizations. So how can we find a solution that decreases the costs of dogs on society and increases K-9 placement at the same time? I think the answer lies in two rarely spoken about, but deeply intertwined issues. 1) 95% of dogs are placed into homes with cuteness and friendliness as the key traits for success. 2) Breeding programs fulfill the demand of homeowners seeking family pets and breed for family-friendly characteristics. In essence, we’re creating a self-perpetuating cycle where dogs are bred to be cute, and little else, and those who aren’t cute enough are killed off. I’m sure you’ve heard of service dogs, but historically, dogs were taken on to do jobs. Hounds were used by hunters for tracking. Golden Retrievers were used by hunters to retrieve bird carcasses. Collies were bred to herd livestock. German Shepherds and Rottweilers were used to guard businesses and families. Just like in human society, a lot of these jobs are becoming antiquated. So, to put a different spin on the problem, what we see today is that the job market for dogs has changed, and many breeds haven’t adapted to this new environment, where the only job left for dogs is nuclear family companionship. Some have, obviously. For the others, we’ve basically constructed a vast welfare state. Golden retrievers adapted wonderfully to the focus on family pets. They’re one of the most popular breeds for families. Not only that, they’re thriving in the service dog market, too, and have found a lot of successful placement as therapy dogs for PTSD vets, depressives, seniors and terminally ill patients. German Shepherds and Collies, too, have found success in this new market. German Shepherds are the #1 pick for police dogs, as they’re loyal, extremely intelligent, dedicated to work, enjoy doing tasks, and are aggressive when ordered. Collies lose out significantly as human society moves more into cities, because they’re high energy dogs that need to perform tasks or they become destructive. However, they are the most intelligent dog breed, and people have found ways to keep collies busy in urban settings. Famously, some collies have been trained to do simple math, and some have been kept busy by partnering with people who need them to perform tasks that require greater memory, language and reasoning skills than other dogs are capable of. Other dog breeds weren’t so lucky or well-adapted to these kinds of jobs. Certainly, other breeds can be used as therapy dogs, guard dogs, and… butlers, I guess. Poodles and labs are popular therapy dogs. Rottweilers and Pit Bulls are popular guard dogs. But those three breeds dominate the ‘jobs for dogs’ world. Guess what they have in common? They are the most intelligent dog breeds. I suppose, just as IQ is a strong predictor of success for humans, it is for dogs as well. So the point here, is that there are jobs that can exist for dogs that increase their ability to find homes in society without relying solely on adoption by nuclear families. And many more. And they’re the cheapest labor there is: they’re paid in food and attention. In order to find those placements, intelligence is a key trait that needs to be developed for dogs. Right now, we’re doing a massive disservice to our canines best friends, because breeders are breeding for specific characteristics: friendliness, cuteness, loyalty and obedience. It’s taken a massive toll on dogs’ intelligence growth. Breeding dogs for these traits has evolved a system of inbreeding to create purebred breeds that lose out when it comes to health and intelligence. We know for a fact that breeding affects animals’ performance. And this can very much go the other way. Since 1949 researchers have been experimenting with breeding domesticity into silver foxes in Russia and Germany. It has been a resounding success, to the point that the foxes that descended from the program are now recognized as suitable pet breeds, the same as cats and dogs. What the researchers did is they collected wild foxes and, over tens of generations, allowed only the least aggressive and most friendly to breed. Over time, hostility toward humans was almost entirely bred out of the genetic line. They took the concept of natural selection and controlled the environment in which the selection takes place. This is exactly what we’re doing for dogs, but we’re ruining their lives. The environment we’ve created is that dog survival depends on their usefulness to humans; but we’ve defined their usefulness narrowly as being photogenic, and their natural selection process has responded. What we really ought to do if we want to help the most dogs possible is be more thoughtful about what we’re asking of them. We need to prize intelligence in dogs at the breeding level so that A) more breeds can catch up to german shepherds, labs, retrievers, collies and poodles in terms of job placement, and B) so that they’re capable of performing more jobs overall. We ought to think carefully about shifting some of the money we provide to animal shelters, which are basically orphanages, to programs that give dogs necessary tasks, like prison rehabilitation training programs. If we do that, we can reduce dog homelessness, euthanasia rates, and costs all at the same time. Ryan is a writer from Los Angeles, California. 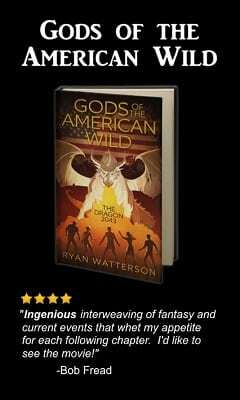 Follow him on Twitter here, and be sure to buy his new book, Gods of the American Wild.